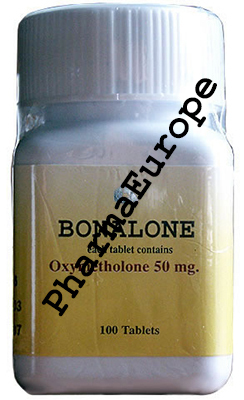 Bonalone,brand name for supstance oxymetholone,produced by Body research,Thailand is a very potent oral steroid.Some studies says that is a strongest oral steroid. The first made was available in 1960, by firm Syntex. Oxymetholone have ability to increase red blood cell production which leads to medical indication to heal a few kinds of anemia. Erythropoietin change it in a medical sphere because of side effects typical for a oral androgen. Begginer can to gain 20 to 30 pounds of mass less than into 6 weeks,with only one or two tablets daily. Reason is high water retention which can have both,positive and negative side.Positive is a higher level of strenght and power becouse lot of water in muscles and joints which can prevent injury too.Negative can be lost of body definition and high blood pressure. Oxymetholone is a derivative of dihydrotestosterone and it is 17-alpha alkylated. 17-alpha alkylated steroids are toxic for liver.Some products like a Cod Liver Oil or Primrose Oil or other which contains linolinic acid support a liver.Other possible side effect are acne,aggresiveness and hypertension.There is lot of antihypertension available.Person need to take some antiestrogen like Tamoxifen,Proviron or Clomid. Clomid is recommend after cycle for returning induvidual natural level of testosteron which helps to save mass get in cycle . Average dose is 1-4 tablets daily for a 5 weeks.